Time to Value (TTV) is the amount of time it takes a new customer to realize value from your product. Overtime, you want to decrease TTV so new customers find value faster. In the world of SaaS, you’re never far away from losing a customer. Never is this more true than during the crucial onboarding period. Once you’ve convinced your customer to purchase or sign up for a free trial, you have a limited amount of time to show value before they churn. No one wants to spend a lot of time or effort setting up and learning a product that might not even do what it says on the can. In the olden days, when customers purchased perpetual licenses, TTV wasn’t as critical. 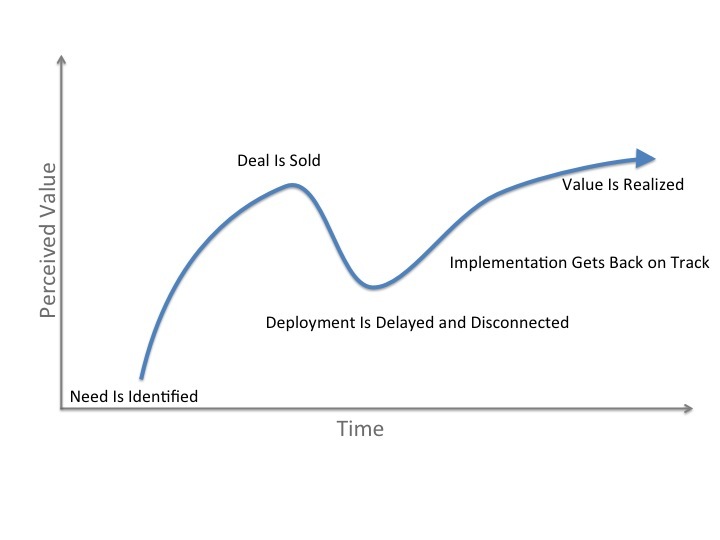 Customers were willing to wade through the “trough of disillusionment” following a purchase, because there was already a large sunk cost in the deployment. With SaaS, this tolerance for delays or frustration is much smaller. Customers tend to churn much faster. A short TTV means customers get a return on their investment of time faster – and that means they are more likely to stick around! We don’t want to get existential here, but to measure Time to Value, you need to know what value means. In this case, it’s the benefit your customer is expecting to receive from your product. Notice that we don’t say what value you want to deliver. This is all about the perceived value from your customer’s perspective. For example, say you’re advertising an e-commerce optimization tool that increases Average Order Size. The value that your customer is looking for is the increase in Average Order Size – it’s not cool reporting, a slick set-up tool or really great customer service. Even if all of those are nice add ons, your customer is giving you money because you say you can increase their Average Order Size. Until that happens…they aren’t seeing the value. If you’re choosing to measure and shrink TTV (which you should), your idea of value needs to be the same as your customers. To decrease your TTV, you first need to discover your Aha! moment. The Aha! Moment is when customers first realize the value of your product. Dropbox’s is the first time customers add a file to their shared folder. Facebook’s is when a user connects with 10 friends in the first week after signup. AppCues has written a really detailed guide to finding your Aha! moment that’s worth checking out. Once you know what makes customers shout Aha! you need to decide the most efficient route to get them to it. Decreasing friction will ensure more customers complete all of the onboarding steps. For example, AirBnB doesn’t force anyone to sign in before browsing because locating a great place to stay is what hooks customers. Onboarding Guides: these can be in-product, documentation or a series of drip emails. They provide information about how to get set up, what to do first and will hopefully smooth any bumps in the road on the path to enlightenment. Customer Success Managers: if your product is quite intensive to set up, try using a more hands-on approach. Customers will see value faster if you personalize the journey. Customer Success Managers can help with set-up, offer personalized training sessions and be a great first contact point. Product usability: the path to realizing value should be the most friction-free, intuitive journey in your product. If instructions are unclear, buttons aren’t properly labelled, or settings are buried in complicated menus, customers will stop trying before they get to the Aha! moment. User testing and product usage statistics will help identify areas where small UX improvements would make a big difference in TTV.